• The European Commission will publish its report for the second phase of Renewable Energy Directive (RED) on November 30th. 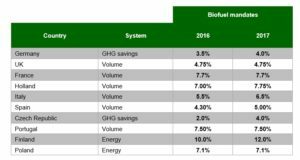 This should set the frame for regulation trends after 2020 and give indication about biofuel feedstocks, sustainability systems and biofuel mandates. • In France, the biofuel mandate remains unchanged next year. Any modifications to the list of feedstock eligible for DC may come only in 2018 and will ask a minimum 50% GHG savings in its mandate. PFAD is likely to be included, however, nothing is certain. • We note that Germany and Czech Republic will increase their Green House Gas savings obligation by 0.5% and 2% respectively. The UK market will also ask for a minimum 50% GHG savings in its mandate. • Euro / Dollar exchange rate dropped significantly after the results of the US Presidential elections. Since Tuesday of last week Euro / Dollar fell by around 3.3% to 1.065$. • FED Chair, Janet Yellen, announced that the American Central Bank could raise its interest rates very soon as American economy is showing encouraging growth rates and a stronger labour market. • The Energy Information Agency (EIA) announced that the US crude oil stockpiles increased sharply last week to around 490 million barrels. This represents a-5.3-million barrels raise while economists were expecting an increase by only 1.5 million barrels. • WTI prices went up by around 1% yesterday to $46.27 per barrel after Russian energy Minister Alexander Novak’s speech saying that Russia was ready to support OPEC members’ decision to cap production by the end of the month. • Uncertainties remain on the outcome of Vienna OPEC summit that will be held on the 30th November. The calendar and the implementation conditions to cap oil supply still need to be discussed.